When Elias Marcello started seventh grade at a new school, he didn’t have many friends. He often found himself sadly eating lunch alone in a deserted corner of the cafeteria, completely isolated. 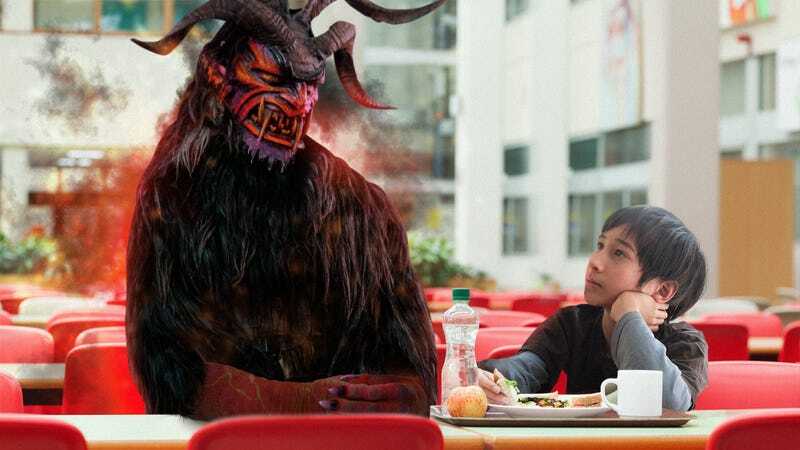 But just when Elias had resigned himself to being lonely, his amazing classmates did something totally awesome: When they saw Elias eating by himself at lunch, they got together and summoned the Devil to sit with him. This heartwarming story took place last week at Westbrook Middle School, when Elias’ history classmate Avery noticed him by himself during lunch period and sprang into action, drawing pentagrams on Elias’ table in black Sharpie. After scrawling 13 insignias needed to summon the Beast, Avery rounded up a group of friends to join hands for the Invocation of Satan, and after just a couple minutes, all of them had collapsed shaking to the floor and the Devil himself had risen up through an ash-black hole in the linoleum to sit with Elias for the remainder of lunch. And… we’re crying. This is the kind of story that gives you hope for the next generation. Well, it doesn’t get more heartwarming than that. If you thought all preteens were self-obsessed monsters, it might be time to revise that notion. To Elias, to the kids at Westbrook Middle, and of course to the Devil, we want to say thanks for making us smile. And keep up the great work, because you’re making the world a better place.